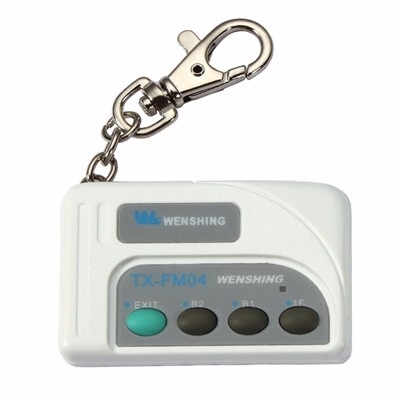 TX-FM04, wireless high-frequency 4 buttons remote controller, using the latest technology to design SAW FSK, replacing traditional ASK frequency modulation. It can be to prevent interference. Two kind of frequency: 433.92MHz and 315MHz, complied with FCC/CE standard. Long-distance is up to 100m. Application: Roller shutter remote control, light control, parking lot elevator remote control, motor vehicle security. Push the button "EXIT", it will be stopped.